Your application must be accompanied by a colour picture of the tartan you wish to register (Scottish Register of Tartans Act 2008 Section 6(7)). The image you submit is checked against the threadcount included in your application to ensure that the two match. Please ensure that the image is in colour, of high quality and high definition. Alternatively, a woven sample of the tartan which you wish to register can accompany your application. Either option must clearly define the different colours of your tartan design to allow us to ascertain whether it is unique. You can attach a gif or jpeg file to your application form by using the browse facility. If you experience difficulty in uploading an image, you can send it by email attachment to enquiries@tartanregister.gov.uk. Please ensure that your email includes the proposed tartan name. 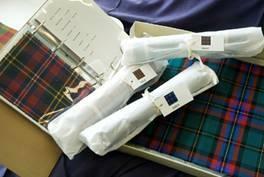 If your tartan has already been woven, or as soon as it is woven, please send us a sample. The sample should be a minimum of 18cm x 23cm (7 inches x 9 inches) or of sufficient size to show half the sett if that exceeds these measurements. Please include both your name and the proposed tartan name with the sample. All images and woven samples submitted with applications will be preserved in the National Records of Scotland and made available for inspection by members of the public (Scottish Register of Tartans Act 2008 Section 4). Woven samples are preserved in purpose-made archival boxes and folders to ensure the long-term preservation of this important collection alongside the Scottish national archives. Once we have received a woven sample of your tartan, the entry for your tartan will be highlighted by the addition of the woven sample symbol (an image of a roll of cloth) and the entry will include confirmation of our receipt of the fabric.